When we first took up residence on Turkey Trot Lane over twenty years ago, it was aptly named. We would occasionally see a flock of wild turkeys trotting down the road or across our yard. These sightings gradually diminished and eventually disappeared over the years. The last time we saw turkeys in their natural habitat was driving along a primary road, which winds through farmland and vineyards, about 20 miles from home. I had to stop and wait for a large flock of turkeys, including little ones, to leisurely walk across the road. This unexpected experience certainly brightened my day! Be sure to check out the links below for interesting facts about turkeys. 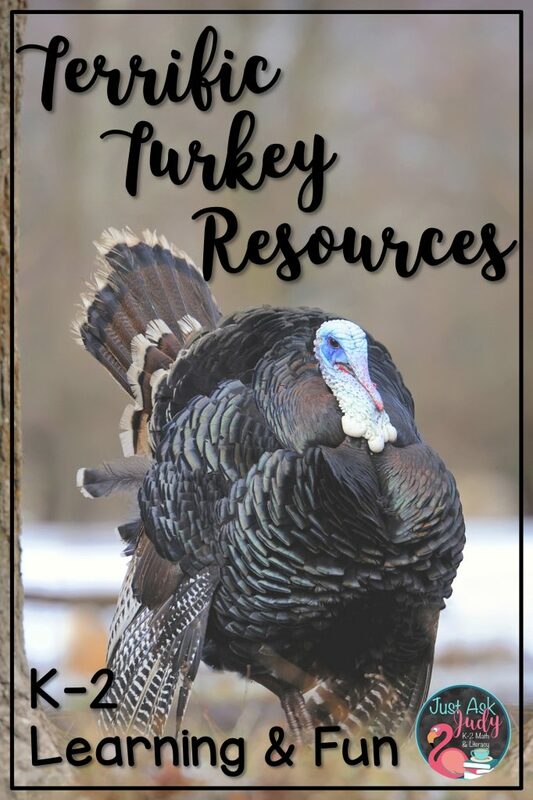 As Thanksgiving rapidly approaches, I have been busy revising old and creating new turkey-themed resources. 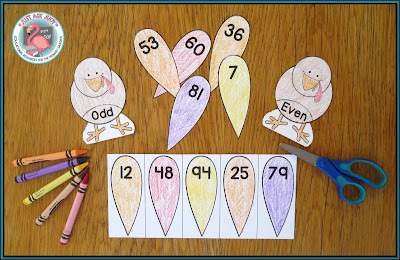 This free Turkey Feather Even & Odd Numbers companion resource can be downloaded from my Teachers Pay Teachers store. It is an easy to prepare cut and paste activity appropriate for first and second graders. 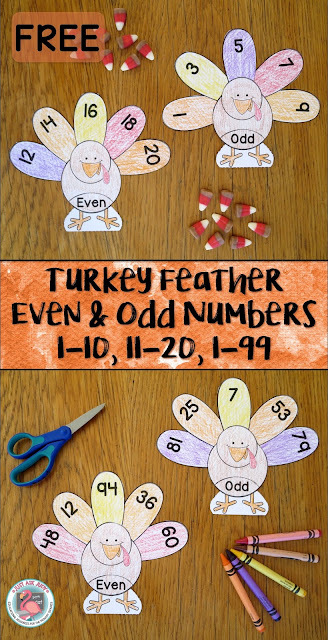 There are sets of feathers for sorting even and odd numbers 1-10, 11-20, and 1-99. Simply print and give each student a pair of turkey bodies and a set of turkey feathers. You can print on white or colored paper. Students color, if using white paper, cut and sort the feathers, and glue the correct feathers to each turkey body. The completed turkeys can be used as a bulletin board or wall display. They can also be glued onto paper. 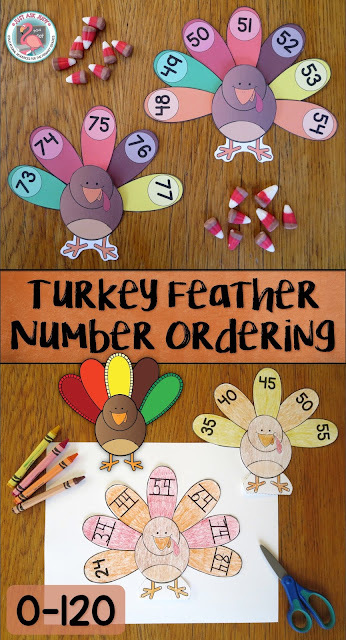 I also created an open-ended resource, Turkey Feather Number Ordering which is available to purchase in my TpT store, for sequencing numbers 0-120 in a variety of ways. 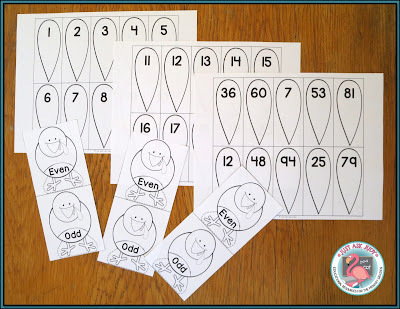 This resource includes a color option for creating math stations and black/ white for cut and paste activities. Ideas for sequencing numbers include consecutive numbers within a decade (24, 25, 26, 27, 28), consecutive numbers across a decade (67, 68, 69, 70, 71, 72, 73), nonconsecutive numbers (18, 35, 41, 58, 75), count by 2’s, 5’s, or 10’s (30, 35, 40, 45, 50, 55, 60), and counting by tens off the decade (42, 52, 62, 72, 82). You can find even more turkey and Thanksgiving themed ideas by perusing this Pinterest board!